Want to practice your putting indoors into a real golf hole in your house? Other than cutting a hole into the floor, how are you going to do this? This is the problem I faced many years ago when I wanted to practice my putting at home. I used may different putting devices but they all sat above the level of the floor. This means you could hit putts too hard which didn’t represent the ball falling into an actual hole and the distance control you need to be a great putter. To solve this problem I invented the Puttacup. 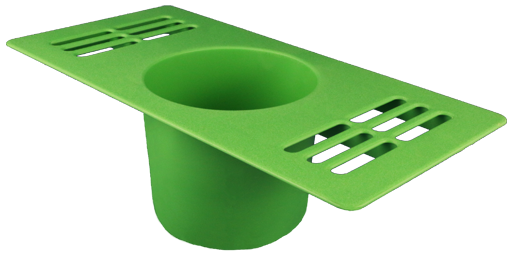 The Puttacup is made from high impact plastic. It inserts into the hole where you insert a standard (4″x10″) floor heating vent. Doing so allows you to get a real hole in your house (upper US states and Canada have these vents). Now when you practice your putting, the ball falls into an actual golf hole in your house just like on the putting green. high impact plastic that lasts for years – 20 years or more! If you’re in a winter climate, or you would like to practice your putting at home, the Puttacup is for you. Over time, you’ll be able to develop your stroke and distance control necessary to sink more putts and play better golf.